Successfully Added K1 PLUS 4K Android TV Box - Amlogic S905 Quad Core CPU, 4 USB Ports, DVB-T2+ DVB-S2, Kodi, DLNA, AirPlay, Miracast to your Shopping Cart. 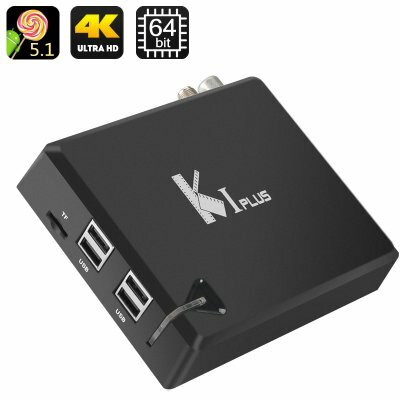 The K1 Plus is a compact Android TV box. But don’t be fooled by its small size. With 4 USB ports, Amlogic S905 Quad Core 64Bit CPU, pre-installed Kodi and more – the K1 Plus is an entertainment powerhouse. The K1 Plus TV box can not only add a few smart features to your TV, but pretty much transform your screen into a complete home entertainment centre. Android 5.1 on a big screen guarantees easy navigation and a convenient interface for managing your media. What’s more, you will have Kodi 15.2 pre-installed – and that means access to great free content online. The K1 Plus Android TV Box comes with 4 USB ports – giving you access to 4 different content sources simultaneously. With the built-in optical port, you will be able to enjoy high sound quality with not distortion and even set up a surround sound system for your home. You can set it right beside your TV or even hook up to the wall to save space thanks to the convenient mounts at the bottom. The K1 PLUS 4K Android TV Box comes with a 12 months warranty, brought to you by the leader in electronic devices as well as wholesale.